What started as a race to survive became a race to the top. 16-year old Cebuano athlete Luis Miguel "Igimax" Maximo, the youngest participant of the XTerra Triathlon Lite last week at the picturesque Amara subdivision in Liloan, did not only grab the champion's trophy in men's 15-19 category but also come out on top in the over-all standings. "All I was aiming for was to finish the race. Gikulba-an ko sa 500-meter swim since that was my first triathlon," beams the youngest member of the Philippine cycling team. "I really did not expect the results, especially the swim leg which I did not feel any nervousness. I think it has something to do when Tito John (Pages) assisted me during our practice swims. It gave me enough confidence to swim in open water, dealing with the strong waves. And I thank him for being patient with me," shared the eight-time Springdale Athlete of the Year awardee. Young Cebuano XTerra warriors and good buddies Igi Maximo (left) and celebrity actor Matteo Guidicelli. Maximo placed first in the men's 15-19 category, while Guidicelli grabbed the second place honors in the men's 20-24 class. Bouyed by the encouraging result, Igimax will take it a notch higher when he joins the 1st Talisay Triathlon today. The grueling race covers 1-kilometer swim, 30km bike and 7.5km run. "I haven't tried a 1,000-meter swim before. What I plan to do is swim the first 500-meter, cling on the bouys for 2-5 minutes to rest, then finish the remaining 500 meters. It will be a slow swim, but I hope to make it up in the bike leg which I am more familiar with," revealed the two-time awardee of the Sportswriters Association of Cebu (SAC). 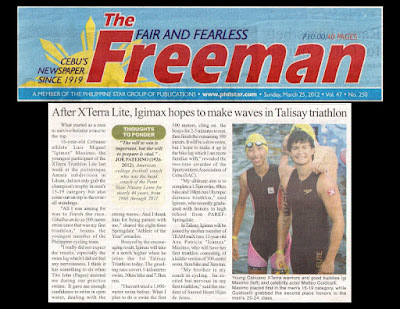 "My ultimate aim is to complete a 1.5km swim, 40km bike and 10km run Olympic distance triathlon," said Igimax, who recently graduated with honors in high school from PAREF Springdale. In Talisay, Igimax will be joined by another member of TEAM maX1mo, 12-year old Ana Patricia "Icamax" Maximo, who will have her first triathlon consisting of a kiddie version of 300-meter swim, 8km bike and 3km run. "My brother is my coach in cycling. I'm excited but nervous in my first triathlon," said the student of Sacred Heart Hijas de Jesus.